First of all what is ICMP? 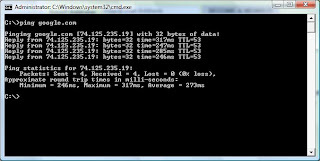 You will come across following ICMP replies when you ping a particular IP. When a PING is successful you get a reply back from the host showing its IP address and other information such as the time it took for the reply to go through. The TTL value determines the maximum amount of time an IP packet may live in the network without reaching its destination. It is effectively a bound on the number of routers an IP packet may pass through before being discarded. This message indicates that the TTL expired in transit. Number of required hops exceeds TTL. Increase TTL by using the ping -i switch. The host that you are trying to ping is down or is not operating on the network. A local or remote route does not exist for destination host. Modify the local route table or notify the router administrator. The ping command timed out because there was no reply from the host. No Echo Reply messages were received due to network traffic, failure of the ARP request packet filtering, or router error. Increase the wait time using the ping -w switch. The IP Address or the Host Name does not exist in the network or the destination host name cannot be resolved. Verify name and availability of DNS servers. This is just to explain different kind of ICMP replies I came across while reading about networking ping and tracert commands..
you select the required files right click on it and there you find “Send To” option. In “Send To” you find the name of removable disk and you simply send the items into it. Well, What if i get the name of my own desired folder there which I use frequently for keeping my stuff. Now in this post I will be telling you how you can create your own folder with in any name in “Send To” option so that whenever you will copy any files or folders, you will simply send them to your folder instead of using CTRL + C and CTRL + V.
Firstly you have to access hidden files. So change your view settings to make all hidden files visible. Tools -> folder options -> view (tab) and select the show hidden files and folders also uncheck hide system files and folder (hide protected operating system file). Now in Send To folder Right click -> create shortcut. Give the folder path you want to access for Send To purpose. Finish shortcut process. Now your customized “Send To” option is ready to go. Today while working with Excel.. I was trying to drag and auto fill serial number. but it didn't work..
That plus sign wasn't coming when I select 2-3 cells so after searching on net I found following solution. 1. Click the Microsoft Office Button Button image, and then click Excel Options. 2. In the Advanced category, under Editing options, select or clear the Enable fill handle and cell drag-and-drop check box to turn drag-and-drop editing on or off. Note To help prevent replacing existing data when you drag the fill handle, make sure that the Alert before overwriting cells check box is selected. If you do not want Excel to display a message about overwriting non-blank cells, you can clear this check box.